I'm a college junior with my whole future ahead of me. And he's the vice I'd give it all up for. 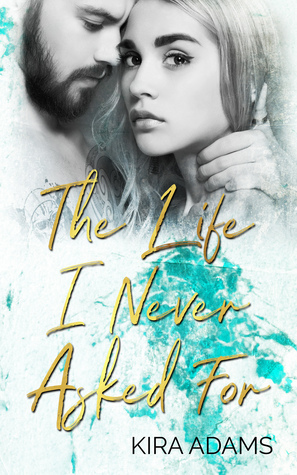 The Life I Never Asked for is the first book I’ve read by Kira Adams, and it is a standalone story. I will admit that the blurb is what drew me in. This one was a bit on the forbidden side and I knew I had to read it. I had mixed feelings about the story, but I would read more from Kira Adams in the future and I think a lot of readers will really like this book. After losing everything, Tobin is left to pick up the pieces of her life and figure out where she goes for the future. She never expects for Keifer to happen, and if her life had gone as planned he wouldn’t have. But now that she is where she is, she begins to embrace the future she never saw coming. I liked Tobin and Keifer. They were great characters. Tobin was very strong and I really felt for her. Both Tobin and Keifer were well written and had depth. I felt the connection and chemistry between them and it was natural and believable. They had me from the start and I was interested to see how things would work out for them. I will admit I didn’t entirely get Keifer’s attitude towards Tobin at first, though luckily that didn’t last long. Tobin’s bias towards Keifer was more understandable, but I was glad to see that shift quickly as well as she got to know the real him. The part where my mixed feelings comes in though, is that while I liked the characters I felt like things were a bit flat here. Going through everything Tobin did, I am hesitant to say that they had things easy here, but there really was no conflict or obstacles for them to overcome. Once they got over themselves (which was pretty early on), things seemed to be mostly smooth sailing. Their emotions did create a bit of resistance towards them having a future together, but it didn’t last long and they easily got past that. Their one big fear about how others would see their relationship was also no big deal and it just felt a bit on the unrealistic side. As much as I enjoyed the relationship between these two and the characters themselves, the story didn’t quite work as well as I would have liked. Don’t get me wrong, I still enjoyed the story and I think readers will like the book. It was emotional and I think readers will be invested in Tobin and Keifer, but I just wanted more. I will look for more from Kira Adams in the future as I enjoyed her writing style.